In our life time, we have two sets of teeth: deciduous teeth and permanent teeth. There are 20 deciduous teeth and 32 permanent teeth. Usually, dentine is slightly yellowish in colour. Since enamel in permanent teeth are more transparent than that of deciduous teeth, the colour of dentine shows through more easily in permanent teeth. Therefore, permanent teeth are usually more yellowish when compared to deciduous teeth. Since dentine thickens as we get older, our teeth may become more yellowish with age. • The outermost layer of the crown. • The hardest tissue of human body. • Generally transparent or milky white in colour. • The second layer of the crown. • Generally light yellow in colour. Its colour determines the overall colour of the tooth. • There are many microscopic tubules inside the dentine which connect to the pulp. 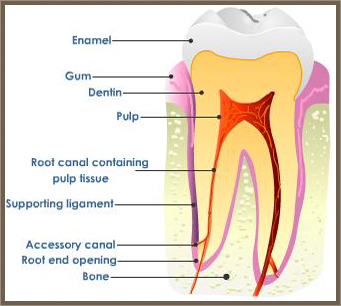 • A hard tissue covering the root surface of a tooth. • Connecting the periodontal membrane and dentine of the root of a tooth. • The chamber inside a tooth. • Filled with blood vessels and nerve fibres. • Also known as "gum". • A layer of soft tissue covering the surface of alveolar bone. • Healthy gingivae is pink in colour. • A layer of fibrous tissue. • Connecting cementum and alveolar bone. • A buffer for teeth to sustain pressure from chewing to avoid damages to the teeth. • Bony tissue surrounding a tooth for its support.